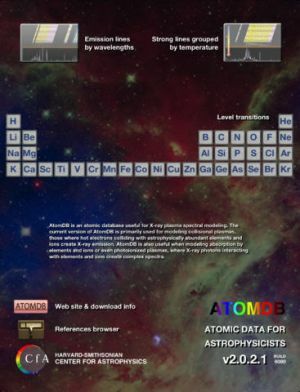 AtomDB is an atomic database that contains spectrographic information used to understand astronomical objects such as stars and galaxies. 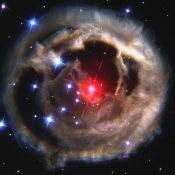 The database presently contains a total of about 74,000 emission lines arranged by wavelength, as well as 54 sets of strong emission lines grouped by temperature. AtomDB displays these lines in graphical or table form, and permits searches by element, ion, and atomic energy levels. The app links to the AtomDB web site, where you can download the database itself, or learn more about the physical processes involved in creating spectral lines. The current version of AtomDB is targeted at X-ray plasma spectral modeling of collisional plasmas, those where hot electrons colliding with astrophysically abundant elements and ions create X-ray emission. AtomDB is also useful when modeling absorption by elements and ions or even photoionized plasmas, where X-ray photons interacting with elements and ions create complex spectra. Esta app es una base de datos de especrograf�a at�mica para buscar iones y energ�a at�mica. Compleja y por lo tanto no de uso habitual en la ense�anza reglada, puede ser �til por el profesorado de f�sica y Qu�mica para mostrar aplicaciones de estas a los alumnos.